Two people tied for fifth place in the first annual Sheehan World caption contest. The contest was remarkable for its lack of entries. Although only two people entered the contest, modern statistical procedures learned at Western Washington University and the University of Washington produced a two-way tie for fifth place. Captions for photo No. 2 were thrown out at random, and the prize was awarded for photo No. 1 only. 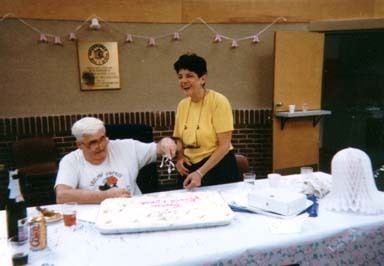 All cars stand by ... Jack McGuire and Gloria Campisi prepare to consume(mate) their wedding cake, which was purchased at an FOP bake sale. Tommy Gibbons (not pictured because he went out for more Diet Coke, and to get his car washed for the fifth time this week) gave the groom away. For their efforts, Gallagher and Bazhaw receive a free subscription to The Sheehan World. The Sheehan World also wishes to congratulate McGuire and Campisi on finally tying the knot and for their good humor in this contest.